Holly Port of Lotion Bar Cafe came down to visit a couple of weekends ago and help out with a class. Unfortunately she wasn’t feeling well so we decided to juice some fresh ginger to hopefully knock out whatever was getting her. As we got done juicing and started to clean up the juicer…we both kinda paused, looked at each other…and I think it was Holly that said…”let’s soap it!” And “soap it” we did! I took some of the ginger pulp and laid it out on a cookie sheet to dry a bit more. Then I put it in a food processor shred it down some more. We used about 1/4 cup in our three pound recipe. Make your lye solution. Weight out the solid oils and melt. 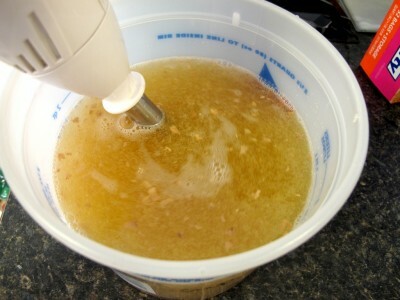 Add the liquid oils to the melted oil. Holly and I decided to add the ginger to the melted oils and stickblend to help break them up some more. Add the lye solution and bring to trace. We wanted to do two bars…one scented and one unscented. So we divided our mixture at trace and scented one. Then pour it into your mold! 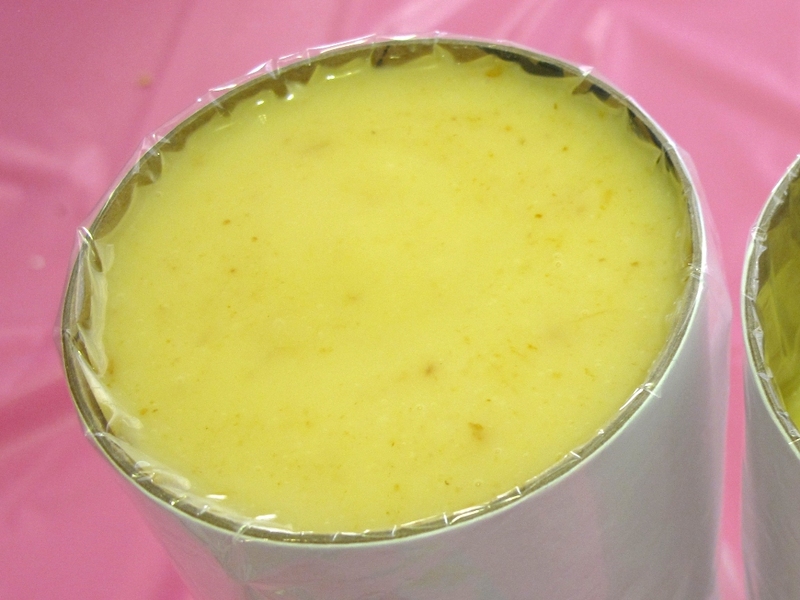 We used mail tubes with liners to make cute 3″ round soaps. After 24 hours, cut your soap and cure for about 4 weeks. I used one today for the first time. Its been curing about 2 weeks so I’ll let it keep curing a bit longer. I love this recipe. Its nice and hard (and palm free). The lather is great and it rinses nicely without any tacky/sticky feel. You can see some of the pulp in the soap so I was worried that it might be a bit scratchy like oatmeal. It wasn’t scratchy at all. You could feel it a bit if you really tried but it was really smooth. It turned out to be a great soap! ps – Do you want to purchase some of the liners used above? I sell them 25 for $10.00 (includes US shipping). Email me amanda@lovinsoap.com to order. See original liner post on how to use them. Hi Amanda can I use some ginger juice? If so, do I blend the ginger with distilled water? I didnt see a post.. I might have missed it but I’m using a soap base. Can this ginger soap be added to the soap base? I don’t want to venture out into actually making the soap as of yet. Hello Amanda, Is this fresh ginger that was grated then added. Greetings coming from the island of Barbados. I am a new soaper & wanted to make ginger soap so I googled. The pulp!… thanks Holly! It came out perfect! I also have two Moringa trees growing in my backyard & I recently used the juice & pulp from leaves along with ginger pulp to make my ginger moringa soap that came out such a lovely olive green color. I thank you both for my soaps! My comment is that my country Nigeria is not high lighted for those you want to do business with. thank you. Be careful not to use too much of the ginger pulp as it could clog your drain. Am from Malaysia, I doubt we have Avocado oil here, is there any other alternative to replace? Could i always use goats milk in any of your recipes instead of water? I love how your recipe turned out, and can’t wait to try it. 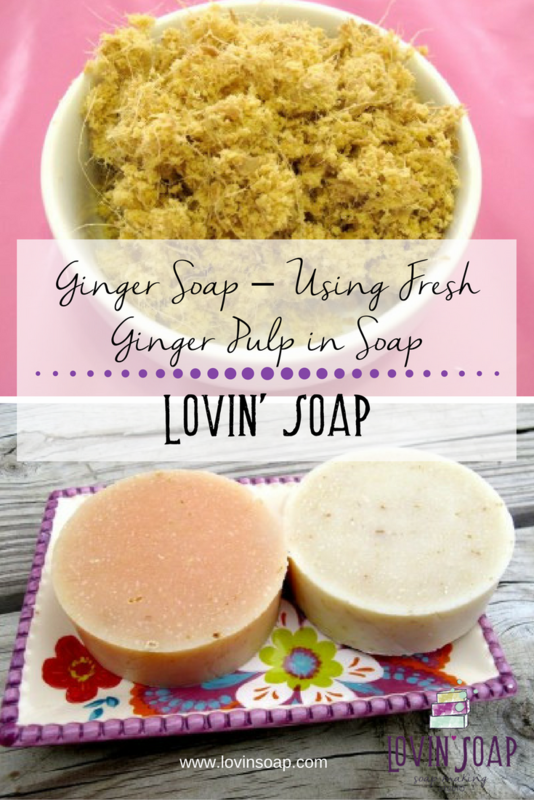 I’ve been soaping for quite a few years, but have yet to try ginger in my creations. It looks wonderful! I just have a question about something I noticed in your blog. You mentioned that this recipe is Palm free. Is Palm oil something that people dislike? Or were you merely commenting that the soap was hard even without Palm oil? I quite love Palm oil, personally, but I also like to learn about the likes and dislikes of other people. Thanks for sharing this awesome recipe! I bet this soap smells wonderful. Hi, saw ur ginger pulp soap recipe, can i make this with a melt & pour base? Love the recipe. I want to try it. 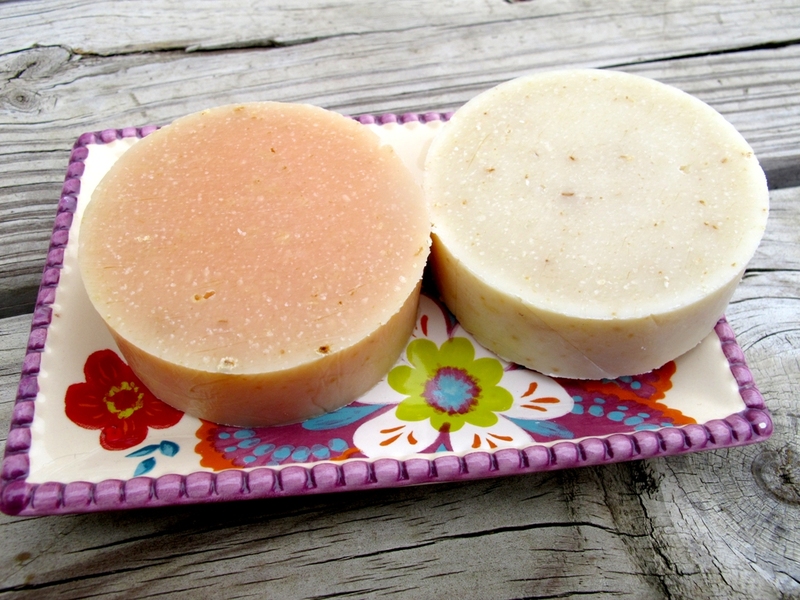 just wondering why one soap looks a pinky color and the other a chalk color? Did you add any color additives? Which one is fragranced? Hi Julie, the one that is pink tinted has the essential oil in it. The other one does not. 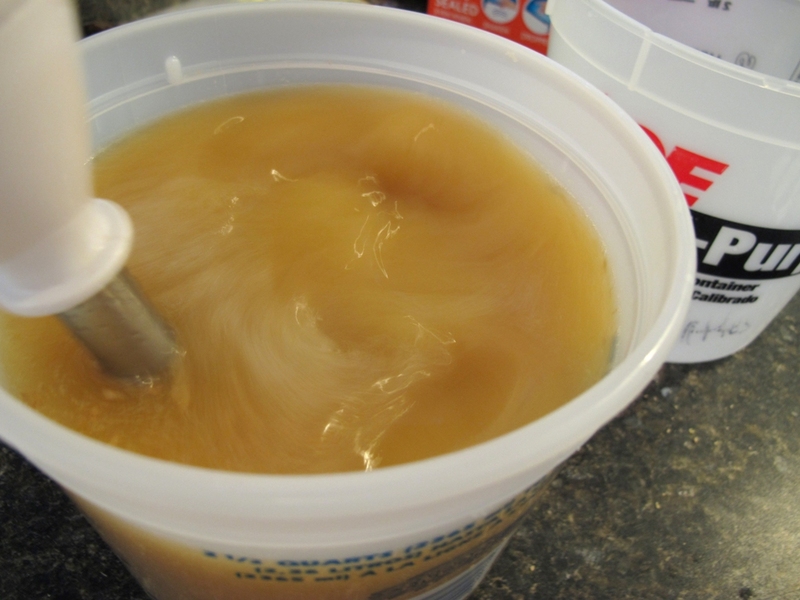 Sorry, I’m late getting in on this….just happened to be looking up “using ginger in soap”. Was wondering if the ginger burned delicate areas any? Hi Shelia, there isn’t enough ginger in this recipe to burn. It turned out to be a really nice bar of soap. Love your blog! I’m from portugal and i can’t find rice bran oil over here… How can i replace it in this recipe? Hi, you can sub with any other liquid oil (besides castor)…so you can use more olive, avocado, sunflower, safflower… Just be sure you run the recipe through a lye calc first. Hi Sofia, you can just use more olive oil in place of the rice bran, or even avocado or sweet almond oil. I just used one I brought back!!! Love it! can not wait until we get to play again! Sounds and looks good, did the unscented one smell gingery? Nope, no ginger smell at all. What oil or frangrance did you used to scent the soap please? Ginger oil? No, we just used a litsea/lime/grapefruit EO blend. Thank you. New to your blog and it’s wonderful and very informative. What a beautiful soap! 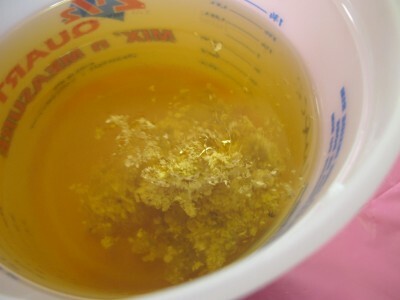 I’ve recently used ginger for the first time to make HP beer soap but added only ginger juice in it. I think that next time I will use ginger pulp as well. Thank you for the idea! I would have loved to have been there at that moment when you looked at each other and had the same “let’s soap it” thought. 🙂 So how does the unscented one smell? ha ha! yeah it was pretty funny !